--tweak changing boy/girl fixes cloth / note: cloth dynamics sliders setup works for the boy setup best. -- Rig max file still the same, Replace scripts related files on Shaterstudio folder if you had a earlier setup. FK-ik controls , stretchy limps &spine , bendy-curvy limps ,biped mocap support ,pose manger, Autolipsync , dynamic realtime -limited- cloth system -2ndry motion , usefull tools integrated. --auolipsync (prime Autolipsync alrady integrated with the character) / use it or leave it all optional you can achieve lipsync by animating face rig. --2 sets of charcters for now , there is a female and male version.-but the model was never made at 1st as multi character so its just some tweaking. --Same old ShaterAutorig v1.0 features as - Naming independant -, you can change the name for putting girl and boy character on the same scene without problems. -- FaceRig is morph based exept extra controllers on the eye Brows . Why choosing between custom rig and Biped when you can have both on the same Rig ?. 2 ways of dealing with biped there is constraints system for testing only , make sure u reset the character before using it , it may gives weird results if there is already animation cause it consider an animation layer. 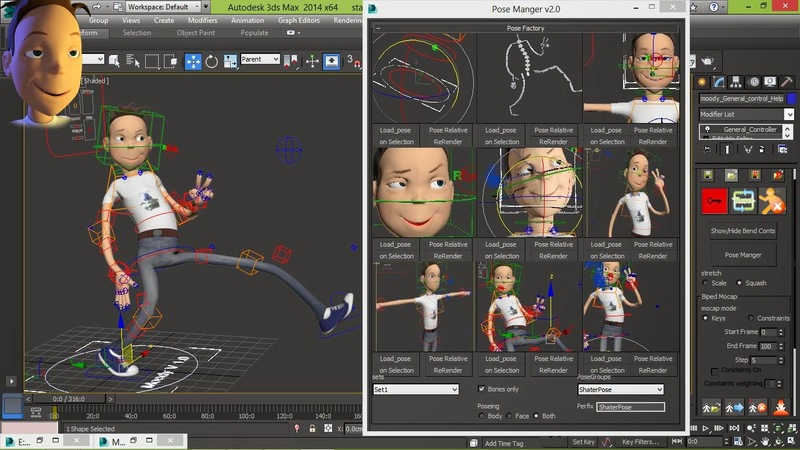 Always work on key mode unless you r testing mocap , Keys mode will capture the biped animation from start time to end . 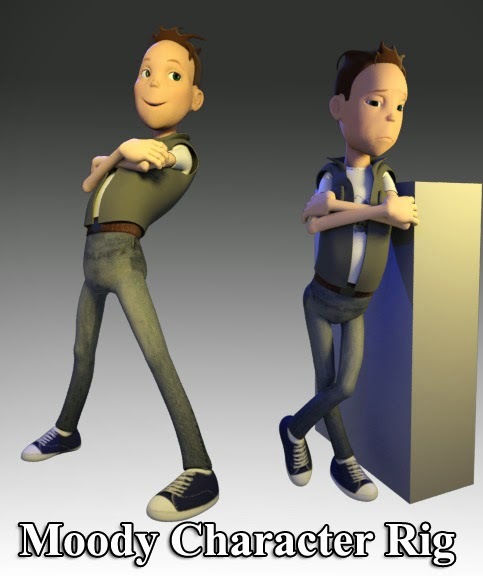 there is a biped attached to the Rig you can Hide/unhide and work with it then Grap the animation by the character rig. next stage on updating this Biped integreation , biped will take poses and animation from the rig too, i have uploaded some tests earlier on youtube channel. --the swivel issue : when u load bip file swivels will be unparented form legs or hands to capture the animation with no issues , when u resets everythings goes back to normal , always i made a button to fix that olso . say if you want to convert bip to xaf animation so you did load bip then save it as xaf from the options UI , u did save it while the swivels is unparented , just remember that . it just small bones skinned to the clothmesh feels gravity and little motion of the body , gives the feeling of simualted cloth on no time , for sure its limited system with few options for now , you can control Gravity or weight of the cloth and the damping/multiplier , test them together . 2nd stage for developing dynamic slider will give more control for the user . 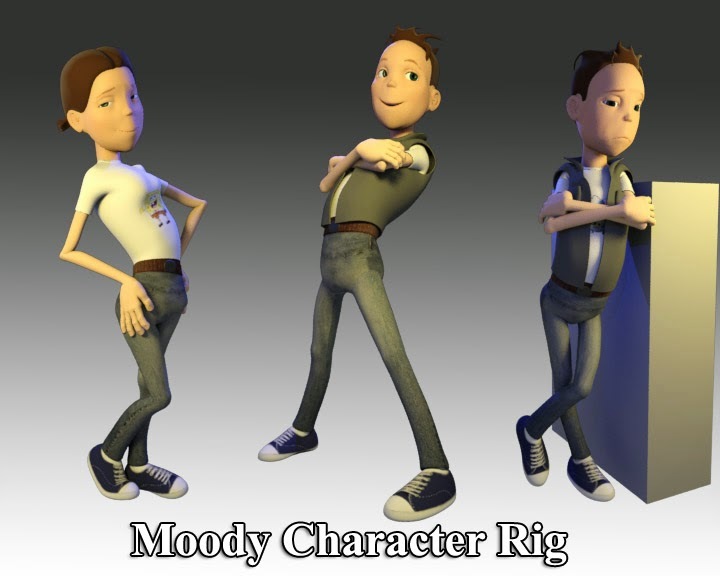 moody rig is mainly beta-testing Shater Autorig and some other tools on production , olso i hope it will be good asset for those guys who seeks a good free max rig , i hope i can provide better model-more appealing character next free rig . the character is free for non commercial usage , would appreciate it if you give me some credit . donations are always appreciated . Feel free to contact me for Bug reporting , ideas for updates or anything on your mind . Hello. I paid for the licensed version of Prime Automatic lipsync yesterday. I really need this script. How soon will I receive it? Thank you.